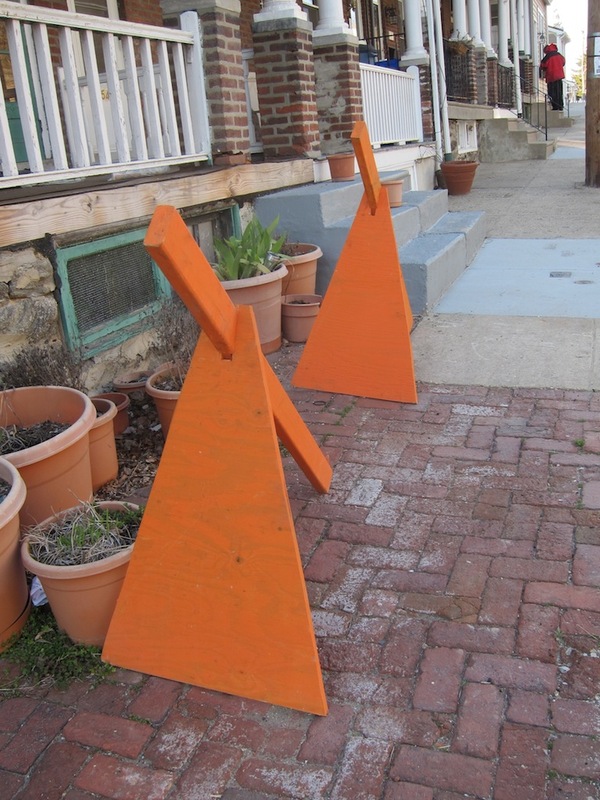 Can there be so many traffic cones on residential streets that you become immune and stop noticing them? 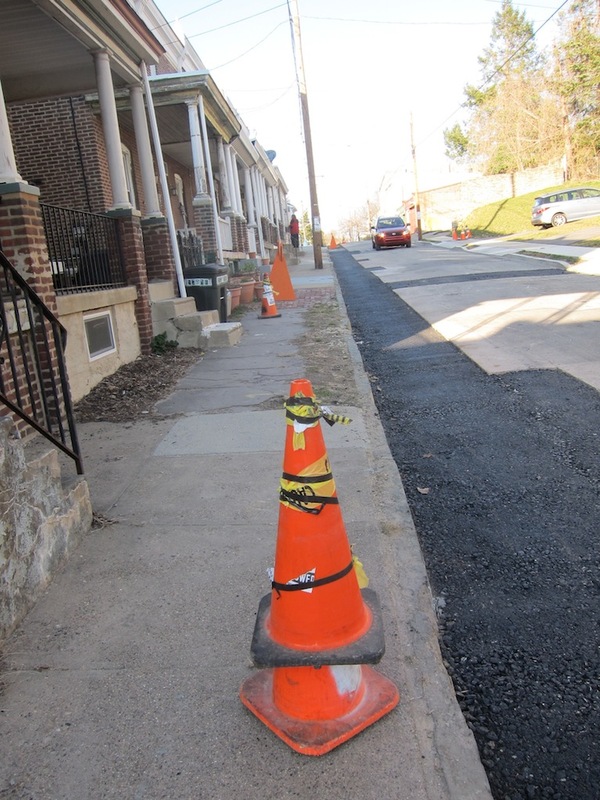 Cones are all around this city neighborhood – cone overload. The reason is ubiquitous new-home construction. One would never guess that the housing market is down; not here. Every scrap of empty ground in this super-packed, cheek-to-jowl area is being covered with new construction; squeezed in the way road cones squeeze moving traffic into too-narrow lanes. In the service of producing these new constructs, the utility companies are busy as robins in the spring, digging up entire streets that extend for several blocks and lining them all with road cones, much like a highway. It is the one colorful result of new houses. 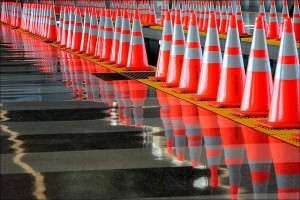 Cones are friendly, geometric and orange, and they can be jarring, especially to alert a driver going the distance on highways. Out on the open road, we sort of know what they are saying and what we are supposed to do when we see them. On a tight 19th-century city street, they squeeze the limited space further, and stand there resembling a queue of penguins on the march, so that they take on a kind of human or pedestrian presence. And, as pedestrians ourselves, we aren’t quite used to face-to-face interaction with a life-size cone. Should we weave through them like a test course? What is the protocol? 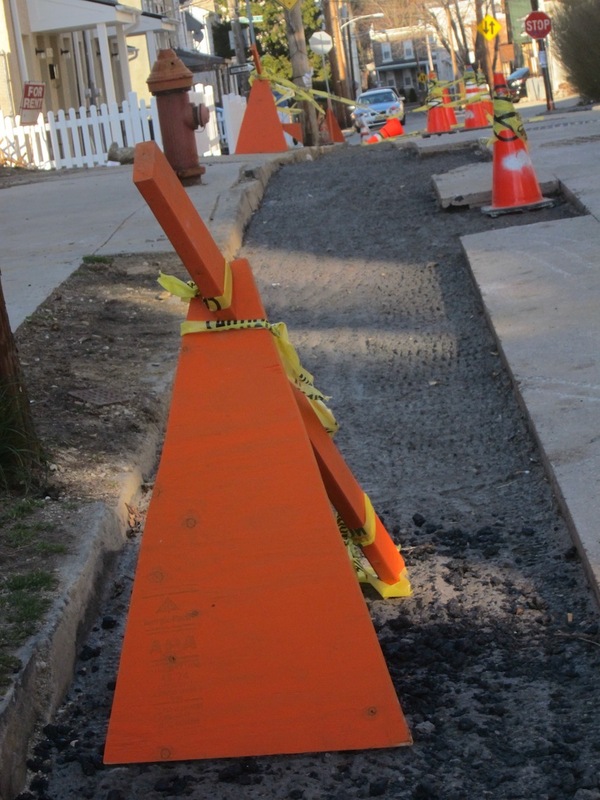 In addition to work zones, cones in the city often represent proprietary space; they can seem in-your-face. Since it is utility companies that use them mostly, homeowners feel that they can nab one or two – since they are taxpayers – and employ them to stand guard and save the parking space directly in front of their door. This strategy is used mostly after a snowfall, but some sticklers decide that it is a useful year-round ploy. The original traffic cones, though, invented in 1914 by Charles Rudabaker, were for the streets of New York – so their provenance is urban. And they were concrete. Try scooting around one of those. They have been made of various materials including wood, plastic, thermoplastics and rubber. And they can range in size from 12 inches to 36 inches. They are usually reflective, aside from their bright, primary palette. With stripes of reflective tape, they remind me of the legs of Munchkins with their stripey socks. They are party hats for the pavement, or maybe dunce caps. Generally speaking, the cones tend to be recognizable. But what is this? A new modern simulacrum of a road cone? Did they run out of the three dimensional ones? They seem makeshift and clever all at once. Like signboards, they are flat but appear full-bodied. They, too, are orange. Plywood, a two-by-four – kind of an easel, but already painted. The weird thing is, these new brethren make the normal cones look fake. Probably, these new cones are less likely to disappear. It seems that cones are popular. People do goofy things with them; they wear them, they make art out of them. 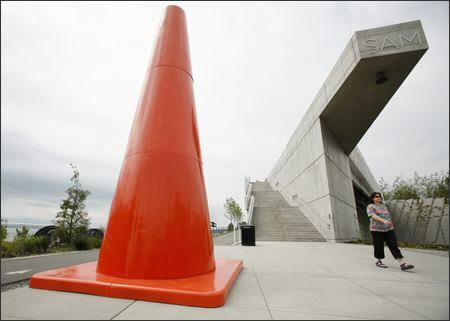 In 2007, artist Dennis Oppenheim made five giant-sized ones, called “Safety Cones,” for the Olympic Sculpture Park in Seattle and other places worldwide – perhaps a tip of his hat to Oldenburg and van Bruggen. 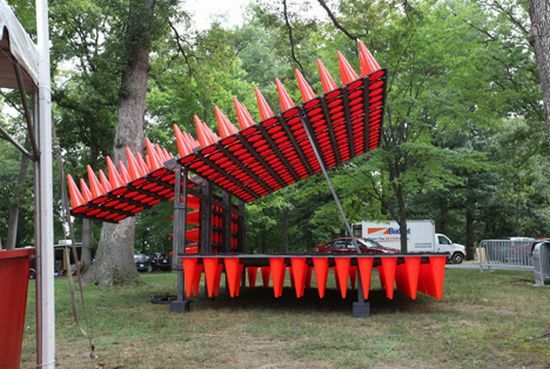 A New York City architecture firm, EFGH, built a concert pavilion out of cones. Cones have become iconic, they are like a universal sign before there were universal signs. They create a placeness wherever they are plopped down. They now decorate my neighborhood. We like them, even with their pointy heads.